For most westerners, Romania is this former Eastern Bloc country of Nadia Comaneci –the famous Romanian gymnast who scored the first perfect 10 in the Olympics. But few people know how beautiful and culturally rich this country really is and how much it has to offer. Among other attractions, Romania is home to many beautiful medieval castles and fortresses. Some of them are famous throughout Europe, others are less known but equally impressive. Unfortunately, most of the beautiful castles in Romania suffered neglect over the centuries. They all remained in a dismal state until the collapse of communism. However, there are are still some great castles and fortresses in Romania that deserve attention. In more recent years, many of these have been rebuilt and restored. Peleș Castle in Sinaia was built as a royal hunting retreat by Carol I of Hohenzollern, King of Romania. The construction lasted for over 40 years (1873-1941) and it costed 16,000,000 Romanian lei in gold (approximately US$ 120 million today). The Castle remained in the royal family possession until 1947, when King Michael I was forced to abdicate and the communists seized all the royal property. Under the Communist regime the entire Peles estate was closed and declared a “State Protocol Interest Area.” Only military personnel and maintenance persons were permitted on the property. In the 1990s, after the fall of Communism, the castle opened to the public and became a museum. 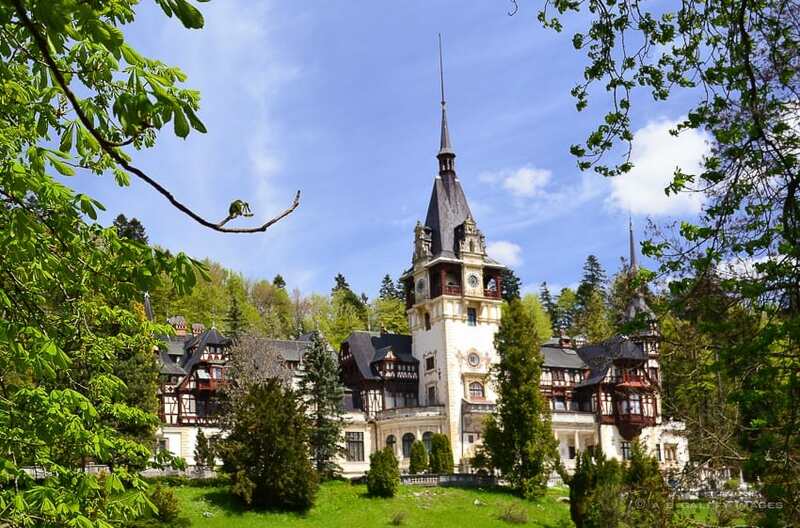 Peles Castle is considered one of the 12 most beautiful castles in Europe. Bran Castle was established as a fortress by the Teutonic Knights, as part of a defense system against the Mongolian invasions. The castle sits in strategic location: up on a cliff, on the passageway between Transylvania and Wallachia (in old Romania). Bran Castle was a gift to Prince Mircea the Elder from his ally, King Sigismund of Hungary. After the death of the Romanian Prince in 1419, Sigismund gave the castle to the Princes of Transylvania. 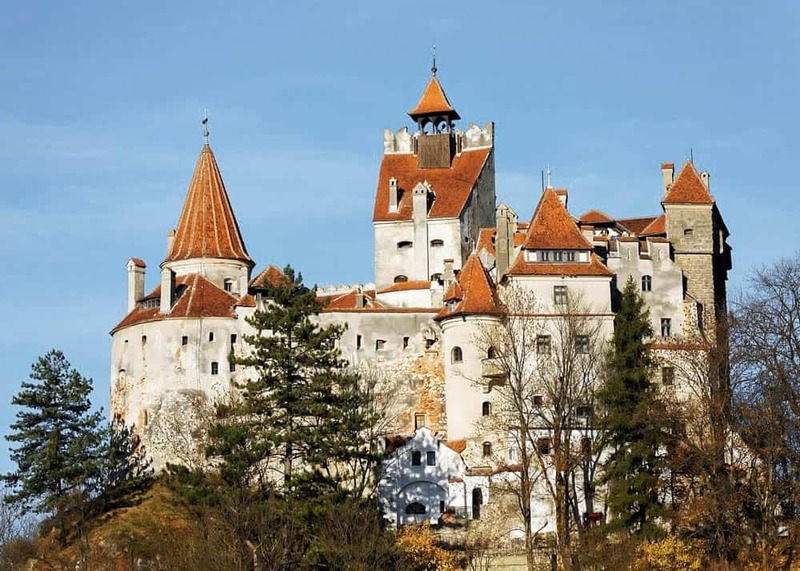 Contrary to the popular belief, Bram Stoker’s character Dracula did not have any connection with Bran Castle. Vlad The Impaler’s only connection with Bran was through an alliance that he did during his first reign with the Princes of Transylvania. They asked him to handle the anti-Ottoman resistance at the border. In more modern times, Bran Castle became the summer residence of Queen Marie of Romania. She did a lot of remodeling and renovations to the old fortress, transforming it into the beautiful castle that we see today. This fairytale castle in the heart of Transylvania is one of the largest and most impressive ones in Eastern Europe. It is without a doubt one of the most instagramable places in Romania. 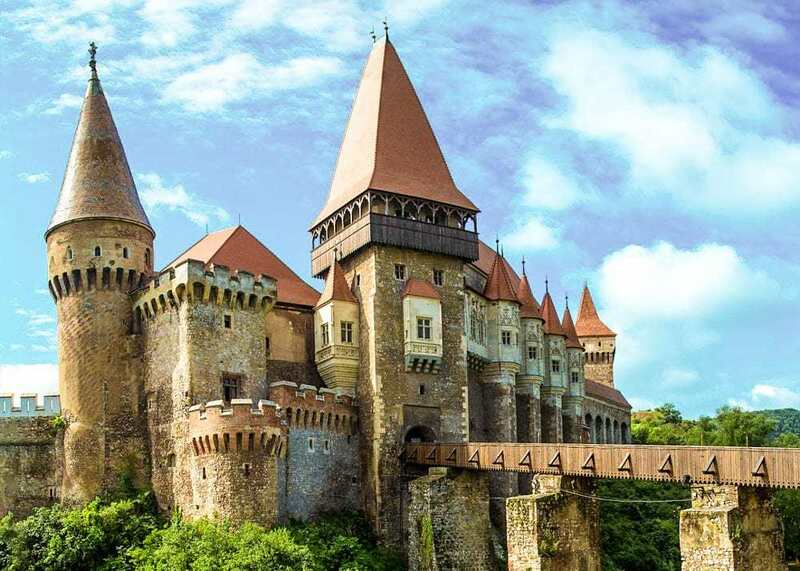 The castle was built in the 14th century by John Hunyadi (Ioan of Hunedoara) on the site of an old fortress that was given to his father by King Sigismund of Hungary. It’s a real medieval architectural gem with pointed turrets, an imposing entrance bridge, scary gargoyles, beautiful fountains and many rooms. Despite the ugly industrial area that surrounds it, the Castle is one of the most beautiful ones in Romania. In 2003 the castle underwent lots of renovations and is today in a very good shape. 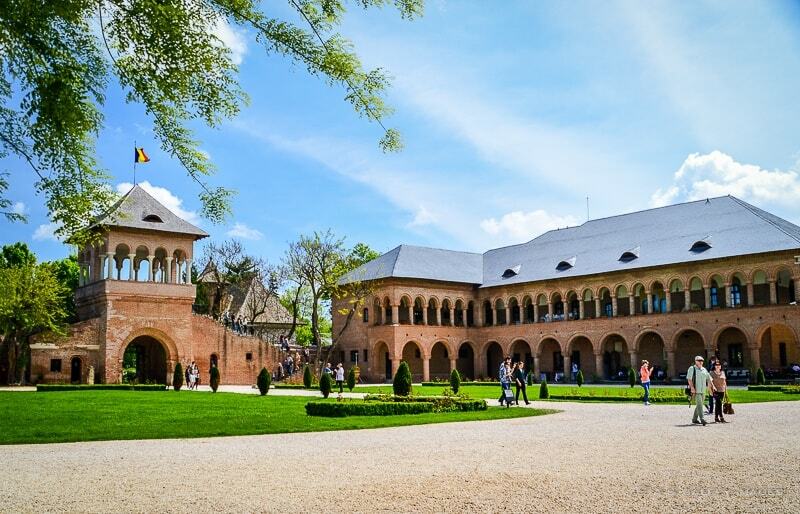 This beautiful palace located just a short distance away from Bucharest, Romania’s capital, was built in the 17 century by Constantin Brâncoveanu, prince of Wallachia. The palace has a beautiful setting, alongside the lake that bears the same name. Built in Romanian Renaissance style (or Brâncovenesc style), Mogoșoaia Palace had a troubled history. In 1714, the Ottomans invited Constantin Brancoveanu and his family to Constantinople and asked him to convert to Islam. As Brâncoveanu refused, they executed him and confiscated his fortune. During the Russo-Turkish War of 1768-1774, Mogosoaia suffered again at the hands the Ottomans. In the following years the castle underwent a lot of restorations, but the Germans bombed it again in 1916. In the 1920s Princess Martha Bibesco purchased the palace and spent her private fortune for its reconstruction. After 1945, the palace was forcibly nationalized by the communist authorities and the owners arrested. During that arrest a great part of the valuable art collection of the palace mysteriously “disappeared.” In 1957 Mogosoaia Palace became a museum. Alba Iulia is one of the most beautiful examples of Vauban military architecture in Europe. The fortress’s history dates back to the Roman period. In the Middle Ages Alba Iulia served as the capital of the independent Principality of Transylvania and the residence of the Transylvanian princes. The fortress of Alba Iulia was built in the 18th century by the Habsburg emperor Charles VI. In the second part of the 19th century most of the walls and bastions were demolished to make room for the modern city. During the communist era, the fortress fell into complete neglect because of the lack of funds for repairs. In recent years Alba Iulia citadel was fully restored, with beautiful walls and gates. When visiting the fortress today, you can still see three of the original six highly ornamented, early Baroque gates. Not far from the city of Brasov there is one of the best preserved rustic fortresses in Romania: the Fortress of Râsnov. This fortification was built by the Teutonic Knights who were brought here to defend the Southeastern border of Transylvania from the Cumans and the Pechenegs. The legend says that during a long siege the citizens of Râsnov asked two Turkish prisoners to dig a well in the center of the fortress. They promised to release the two men to once they completed their task. According to the legend, it took the two people 17 years to finish the well. Unfortunately, the citizens of Râsnov didn’t keep their word and in the end they killed the prisoners. The famous 146 meter deep well still sits in the center of the fortress. The old Fortress of Râsnov underwent a lot of restoration and the remains look quite impressive now. There is also a museum where you can see some interesting artifacts. 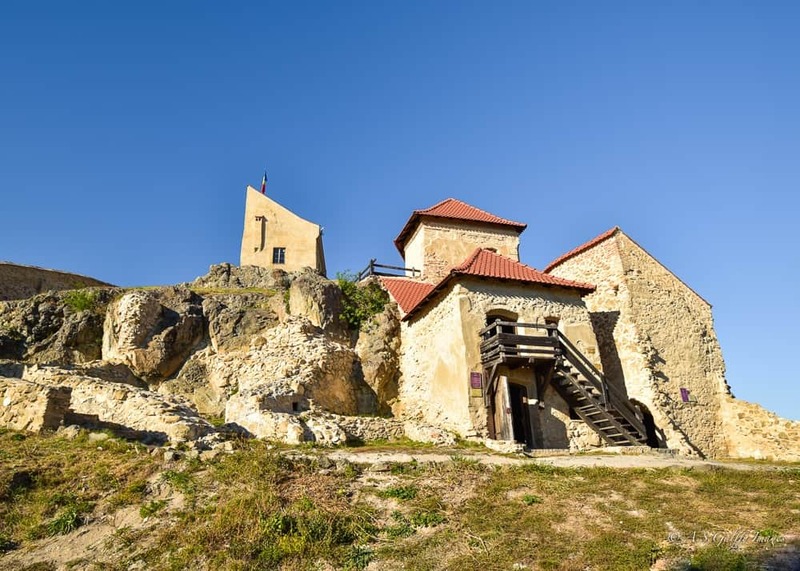 Also known as Stolzenburg, the Fortress of Slimnic was completed at the beginning of the 14th century, as a refuge place for the Saxon communities in the area. The construction was realized entirely from brick on the site where a smaller fortification used to be. At first a Gothic chapel and the current bell tower were erected. A new building (probably a church with three naves) was added towards the second half of the 14th century, but that was never completed. The western wall of the fortification with crenels and loopholes was built in the 15th Century. During the 16th century the fortress was extended again and reinforced to better resist the attacks. Over the centuries the Fortress of Slimnic was besieged in various occasions first by the by Turks then by the Hungarians. The repeated attacks mainly destroyed the second ring wall, which surrounded the parish church built in the 14th Century. In the 18th century, after the rebels of Francisc Rákóczi II set it on fire, the fortress was abandoned for good. Established by the Saxons in the 13th century, the fortress of Rupea is one of the oldest medieval sites in Transylvania. In Hungarian, the fortress’s name was Köhalom, meaning “mound of rocks.” It is believed that at some point almost 400 people lived between the walls of the fortress, where they had all the necessities: a parish, a chapel, a local market, a fountain and even a so-called “bacon tower”, where all the meat reserves were stored. The the fortress served as refuge for the inhabitants of the surrounding villages against attackers. Although once one of Transylvania’s most important citadels, Rupea was slowly abandoned. By the end of the 19th century it was just a pile of rocks. During the Communist era the ruins of Rupea barely escaped total demolition. After the fall of Communism in 1990, the local authorities made several attempts to restore the fortress but the lack of funds made the restoration impossible for more than 20 years. Finally, in 2013, the once derelict ruins had undergone extensive renovations. Today the fortress of Rupea is a major tourist attraction in the county of Brasov. Located in the County of Sibiu, Biertan is a typical Saxon village easily accessible from the main road. In the centre of the village there is one of the most imposing fortified churches in Transylvania. The fortress-church of Biertan was first mentioned in a document of King Matei Corvin in 1486. The spiritual and defensive center of each village was a fortified church. This is where the villagers would retreat in case of an attack. They used to store dry food (flour, bacon) within the church walls and used it when they had to retreat. Because the thick walls remained cool year round, food was easy to preserve there. The fortress has three exterior walls and five towers, each one interesting on its own way. 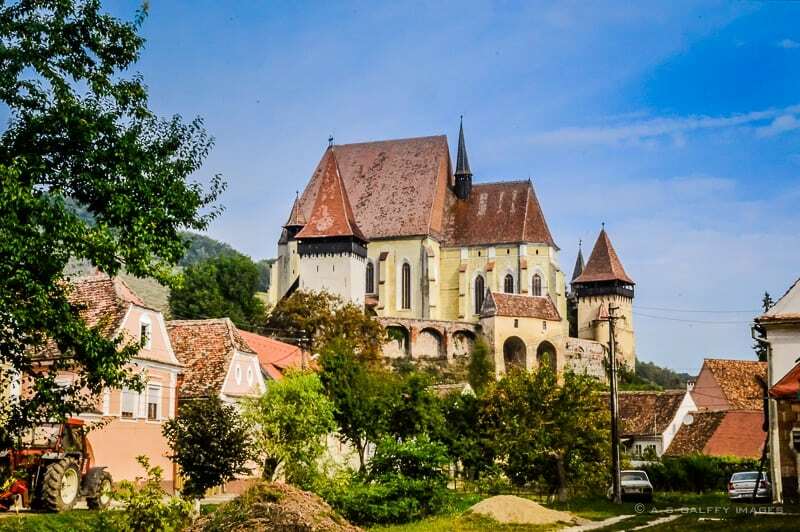 Saschiz is a beautiful little village located about 20 kilometers from the city of Sighisoara, in the heart of Transylvania, in the Mures region. 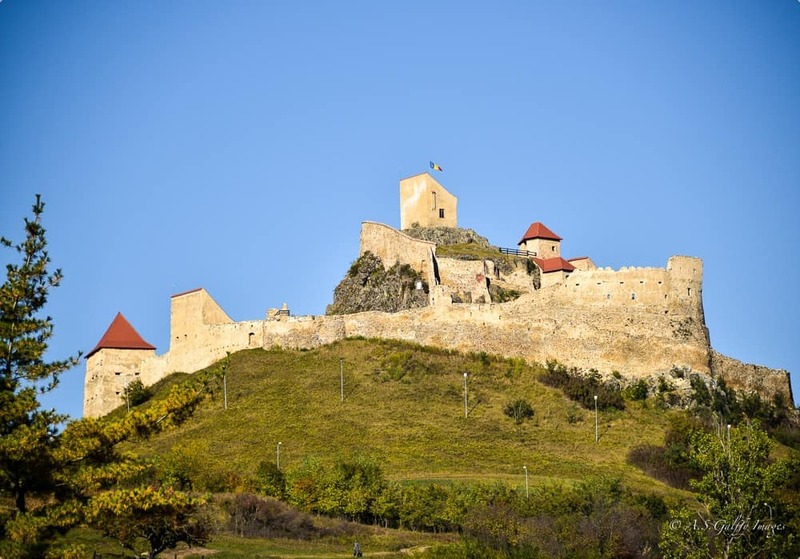 Saschiz is known for its medieval fortress and church constructed by the Saxons, a population of German origin who settled here when Transylvania was part of Hungary. The ruins of a 14th-century fortress sit atop a hill overlooking the village. There is a small dirt road from the village center that leads to the ruins. Part of it is drivable, but the rest you’ll have to walk through a forest (about 15 minutes). The walk is not very difficult and it’s well worth it. Saschiz was once a defensive fortress that protected the town against the numerous invasions in the region. Although almost destroyed, you can still see a good part of the former fortress and walk around the ruins. There is a beautiful view of the village and the famous Clock Tower from up there. The Clock Tower from Saschiz is one of Transylvania’s most beautiful medieval monuments that also belongs to a fortified church built by Saxons in the 15th century. The Tower is admired by everybody who travels the European road (E60) that crosses the centre of Saschiz. Ooooh my gosh. Corvin Castle! #swoon That really is a fairy tale setting. We have never been to Romania, but we definitely feel the country calling us. And when we go, we're taking this list so we don't miss these awesome castles! Great list Anda - we really enjoyed it! They're all so beautiful, I wouldn't even know which ones I would pick to visit if I ever got the chance. Of course, I hope to visit them all! What a great list Anda! I've been to Bran, Peles, Corvin and Rasnov and each really impressed me. I was quite disappointed that I didn't see Biertan, so its definitely my most anticipated for next time. I wasn't familiar with Saschiz so that has gone on my list. Thanks for your comment, David. Romania is pretty close to you, so it's easy to go back and visit more of these castles. I never realized there were these many beautiful castles and fortresses in Romania. I have such a fascination with European castles and I'd love to visit these someday. I really love how Hunyadi looks. Straight out of a fairytale book. WHat a great and interesting post and beautiful photos, Anda. I´ve really wanted to visit the Peleș for so long since I saw somewhere its gorgeous interiors!!! I didn´t realize there were so many beautiful medieval castles and fortresses. I guess most of the people only know the Bran Castle and of course, the Transylvanian area is famous because of Dracula, but Romania really has much more to offer. Hope to visit soon! We love exploring old castles and palaces, especially if they're furnished to show you how lavishly the inhabitants lived! Peles Castle looks particularly beautiful :-). Yes, indeed, Janice. Peles Castle is one of those where furniture was still left intact after all these years. Wow, Romania looks so beautiful! And so rich in history, it's been on my bucket list since I was a teenager. You've put together a wonderful list! We were quite lucky enough to manage to see 3 of them in our short time in Romania. I had wanted to visit Mogosoaia Palace while we were there but couldn't fit it in! Next time though! Some of these though I haven't heard of yet and will be adding them to my list! It's great that you could see some of these castles, Lolo. Oh wow, I love this article. Over the years I have read so many great things about Romania and seen so many wonderful photos. This article, too, proves that it is a destination I simply must get to! Glad to know you liked my article, Esther. Anda, we just came back from our Romanian trip! we only had a week and included two of the castles on your list. We also visited some medieval towns, Bucharest, the mountains and a sea break. There is so much diverse beauty! I'm glad you had a good trip to Romania, Victoria. I'm going to go there too in October. This is a great post. The history is very interesting. We were in Istanbul recently and the whole Ottoman backstory is so fascinating. I have to admit I don't know much about Romania. I have heard of Bran's Castle but the rest of these are new to me. They all look amazing. Hopefully, I can make it to Romania at some point. Isn't it amazing how beautiful these castles are, restored? Other than the Mogosoaia, I've visited them all over the years, some of them before they were reconstructed. Last time I took my family to Risnov and Rupea, I barely recognized them. I'm disappointed by the way they turned Bran into this huge tourist trap though, but I guess it was inevitable. I'm glad though that the other castles, once lesser-known, are reconstructed and enjoyed. So much history there! Love your photos, they are gorgeous! Thanks, Emese. I like revisiting some of these castles once in a while. Lovely post! Did you drive in Romania? How are the roads? I've not yet driven in eastern Europe and hope to change that in the near future! This post certainly has whetted my appetite to visit Romania. Beautiful! The roads are OK, Lorri. Romania has highways and even a couple of freeways, but unfortunately the highways go through villages where the speed is reduced and where you can encounter bicycles and sometimes horse-drawn carts. Fascinating post! These castles look extraordinary. Well, I must hand it to the people who market Bran Castle to tourists, because it's certainly got the Dracula market cornered. :) My cousin has always been an aficionado of the book and could probably write a tome about all the facts and legends surrounding Vlad III, who inspired Bram Stoker's famous character. I'm guessing you've not visited Poenari Castle, Vlad's home (it's in Arges County). It's just ruins now, but even if it were restored it is hard to imagine that it could ever have been as beautiful as the stunning castles you shared in this post. Until now I've wanted to visit Romania simply for the Transylvanian scenery, Roma culture and the painted churches. I can see there's so much more to appreciate than even that. I guess we'll need to plan to spend even more time there. Now is the best time to plan a trip to Romania, Linda, while it's still cheap. It's a beautiful country and I'm sure you'll enjoy it a lot. Romania has come a long way from the time I've been there, Suze. I see surprisingly good changes every year, which are a sign that the country is on its way to recovery from the scars of Communism. Looking forward to seeing these forts and castles when I get to seeing Eastern Europe ... next summer perhaps! I remember that perfect 10, and yes, it probably was all I knew about Romania (other than Dracula) as a child. I love medieval castles and fortresses, and these are all beautiful and interesting. So much history. My youngest daughter has Romania high on her list, so we will probably get there before she is grown. Make sure you do, Rhonda. You'll love Romania, especially the northern part of the country. These castles look extraordinary. Romania will no doubt get a huge influx of tourists if you keep writing posts like this and the one you wrote about the monastery last week. I particularly like the look of that village, Sashchiz. So pretty! Ha,ha,ha! I may be driving some tourists to Romania with these posts, but I don't think they will be sorry. Tourism is just beginning there and Romania is still very cheap. Really worth going now. Really enjoyed reading about the history of Romania. I had no idea the that the scenery was so beautiful or the towns, fortresses and villages were so fascinating. It really is beautiful. And these are not even the most beautiful castles that Romania has. There are many more. I have been quite interested in visiting Romania for several years now ever since seeing beautiful photos from my friends' visits. Your informative post on castles and fortresses, especially the photos of Castle Bran and Saschiz, makes me want to plan for a trip in the near future. Thanks for hosting #TheWeeklyPostcard. Thank you, Ahila. I'm glad to hear that my post and photos convinced you to go visit Romania. I'm a sucker for castles, just love the medieval mystery about them. I had no idea there were so many castles in Romania. Fascinating post, Anda! Until reading your recent posts, I had no idea now beautiful Romania is! It looks like you had wonderful weather when you were there, and your photos are, as usual, wonderful! I'm glad you liked it, Debbra. Romania has so many castles and fortresses that you can't imagine. These are just a few of them and not even the most beautiful ones. Wow, this is incredible. Medieval castles and fortresses have always fascinated me, seeing as we don't have any of that in Singapore. Especially intriguing? The multipurpose fortified church. It doesn't really look like a fortress! I have to confess that for the longest time whenever I heard "Transylvania", I thought "Dracula". My boyfriend went to Transylvania a few years back. He had some interesting stories about getting lost miles away from anywhere after dark. All ended well though. Great read, thank you! This looks stunning - I've never really thought about Romania but it definitely looks worth checking out!! I hadn't realised how 'intact' it was, historically. Fab photos and fab post! You've sold me! Well, thank you Lydia! I think Romania should thank me for advertising it so much. I was actually born there and love going back once in a while. Romania always seem to look so green and beautiful! I went to graduate school with someone from Transylvania who has since moved back and tells me I need to come visit. Romania is definitely one of those places I look forward to exploring in the future! You should take advantage of your friend being in Transylvania, Jessica. She could show you the beautiful sites in Romania.